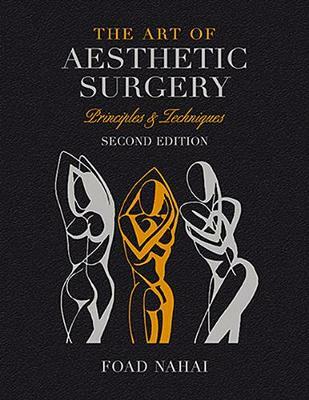 Seldom does a book achieve status as a classic in its first edition, but The Art of Aesthetic Surgery by Foad Nahai has been hailed as a masterpiece since its inception. Reviews have been universally laudatory, and residents and experienced practitioners alike have embraced this work as the ultimate resource on all things aesthetic. Now, this landmark work has been totally revised and updated with new chapters (many with new authors) and revisions to existing chapters to reflect the latest trends, techniques, and information. The text is supplemented with two DVDs with step-by-step videos of operative procedures. The first volume begins with patient fundamentals, selection of anesthesia, and business basics. It discusses skin care and dermatologic treatments, facial fillers, and dermabrasion and chemical peels. It also explores hair transplantation, brow lift, blepharoplasty, and avoidance and treatment of complications of aesthetic eyelid surgery. Dr. Foad Nahai is an acknowledged leader in aesthetic surgery. He has personally written many of the chapters. His contributors, representing the "who's who" of aesthetic surgery, provide detailed accounts of their techniques for the different operations, as well as the planning process so crucial to producing excellent results. Of particular note are the clinical decision-making chapters authored by Dr. Nahai. This invaluable insight provides readers with a unique overview of the various options for each problem, along with his preferred solutions. Complete with algorithms and case studies, this problem-solving feature offers the expert guidance necessary to sort through options, understand their advantages and limitations, and make the best choice for each patient. Key chapters introducing each major anatomic region or topic area focus on applied anatomy and provide essential information that the surgeon needs to know to execute these surgical maneuvers safely and effectively.